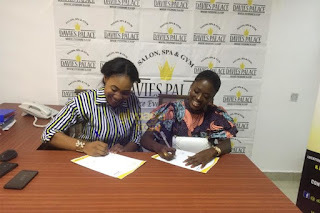 Ghanaian actress from popular Tv series “Yolo” Fella Makafui has inked a One-year mega-contract with Davies palace and Spa. The ‘Yolo’ actress was announced by top executives of the company on Monday, May 21, 2018, in Accra at a short ceremony. Managing Director for the company, Rena Cudjoe speaking at the unveiling told the press that Miss Makafui will be the face of the company for the next 12 months and the deal is subject to renewal after the period. Speaking on why they decided to sign the actress as its brand ambassador, Miss Cudjoe revealed that Fella appeals to the youth and the middle class in the society who are also the main target of Davies Palace so inking such an agreement with her would help the company. Executives of the outfit failed to quote the amount involved in the deal but assured the press that the money was a hefty sum. Fella, on her side, thanked owners of the company for believing in her brand and giving her the ambassadorial role.